17 More Pictures Of Version 64 "Dominck Trey"
I wish I had noticed he didn't have a solid color shirt on! It takes away from scarf! Ignore the colors on shirt! If a solid color is used with scarf it would awesome with all the bright colors piled on top. He thinks he is charming a snake. The scarf would look better if he had a solid color shirt on! I didn't notice until I was done! Here is a solid color on the back of his shirt! It looks better from the back view! Scarf is extremely long. It is 13 feet, 2 inches. These are only estimates. Length will vary due to type of yarn used, whether it is crocheted tightly or loosely, and will stretch some when placed around neck. When making an enormous amount of chains try to keep them firm so that they are all consistent in size. A firm ch is needed to ensure a smooth edge on the scarf. Loose chains will look sloppy on the side; an edging can be done to hide it. Use safety pins as stitch markers. Chain in groups of 50 and place a safety pin as a marker. Scarf is 3, ¾ wide. If a wider scarf is desired add another set of each color. Tassels or fringe can be added to scarf for more interest. Change to size I hook. Fold scarf in half with right side facing up. Choose which long side, Teal or Burgundy will be attached to hat, mark center with safety pin. Place top of hat in lap, holding the bottom of hat mark with a safety pin in the first dc made in round 18. Remove safety pin from scarf and attach to safety pin in center of hat. Count 13 stitches on each side of center of hat and attach safety pin. It will take about 3 ½-4 yards to whipstitch together. With right sides facing upward, place hat in lap or on a flat surface with edges touching. Using yarn needle, leaving a 10 inch tail for weaving in, whipstitch edges together. Place 3 stitches in first dc to secure. In remaining dc’s place 2 stitches in each. In last dc place 3 stitches to secure. Weave ends in for 6-8 stitches, reverse and go in opposite direction. Do this a minimum of 4 times to secure scarf. To learn how to whipstitch, Google “how to whipstitch”. Crochet Spot has an excellent tutorial on how to whipstitch in crochet. There are awesome pictures that make it easy to understand. There is a lot of great information to improve your crochet experience at Crochet Spot. Red Heart in colors Teal, Burgundy, and Yellow were used. Basic Hat Pattern Version 64-E "Dominick Trey"
Scarf is placed around neck to show what it will look like with this color hat. Red Heart in color Yellow was used. 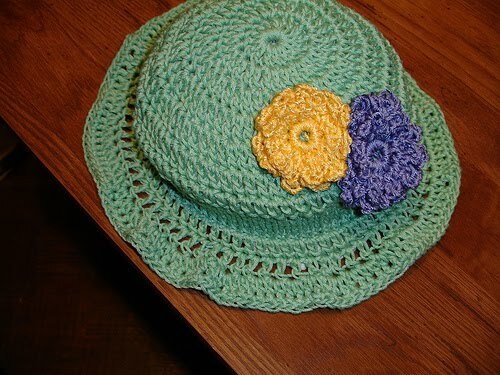 Basic Hat Pattern Version 64-D "Dominick Trey"
To save yourself some time and less work, carry your ends behind your next row you are starting and crochet over them. Rounds 11-15. Repeat round 6. Sl st in top of first dc made. Basic Hat Pattern Version 64-C "Dominick Trey"
Red Heart Burgundy was used for this hat. Basic Hat Pattern Version 64-B "Dominick Trey"
Basic Hat Pattern Version 64-A "Dominick Trey"
Red Heart in color Teal was used. Save some time and less work, carry ends behind the next round, and crochet over them. The hat is longer than the basic hat pattern, version 1. It is made to stand up instead of pulling down completely. A pom-pom or tassel can be placed on the hat but it will no longer stand up. For a shorter length hat, omit rounds in groups of 2. For a longer length hat, add rounds in groups of 2. Round 4. Ch 2, 2 dc in same sp as ch 2, 1 dc in next 2 sp, (2 dc in next sp, 1 dc in next 2 sp) 11 times. With right sides facing upward, place hat in lap or on a flat surface with edges touching. Using yarn needle, leaving a 10 inch tail for weaving in, whipstitch edges together. Place 3 stitches in first dc to secure. In remaining dc’s place 2 stitches in each. In last dc place 3 stitches to secure. Weave ends in for 6-8 stitches, reverse and go in opposite direction. Do this a minimum of 4 times to secure scarf. The Burgundy side of scarf was chosen to be attached to the bottom of hat which is also Burgundy. Basic Hat Pattern Version 64 "Dominick Trey"
Scarf is NOT joined to hat in this photo. Scarf is attached to hat. I finally finished Basic Hat Version 64! His back is a solid color. I think it really looks great with a solid color shirt! It is a huge pattern, lots of ideas, lots of choices. I broke it down into sections so you can print only the patterns you wish to use. When I started to create this hat I was wide awake at 3 am. I started thinking about a really unique hat, and I came up with this idea. I crawled gently out of my bed and opened my door just enough to get out and went across to my craft and computer room. While taking notes I thought of several ideas for hats. I am working on them now. There are 7 patterns to choose from. You make the scarf first because that determines what color the hats will be. The scarf is joined to the hat color of your choice. You can leave the scarf unattached and use it for as many hats as you desire. I took lots of pictures and after I was done I noticed my son did not have a solid color shirt on. Ugh. Fortunately I took some of his back which is a solid color! It took me a week to make all the chains for the scarf! I kept getting impatient so I took my time. I tried really, really hard to catch all the mistakes, please if you find something let me know! I would greatly appreciate it! Happy Anniversary to Me and You!